(Office of Her Majesty Queen Rania Al Abdullah – Abu Dhabi) - Her Majesty Queen Rania, in a keynote speech today at the opening ceremony of the Abu Dhabi Sustainability Week (ADSW), highlighted the importance of long-term, sustainable solutions to addressing energy needs and powering sustainable development globally. The annual event drew leaders, government ministers as well as experts in the fields of energy, environment, food and water and other participants from a total of about 150 countries, gathered to address energy, water security and sustainability challenges facing the Middle East and the world. Her Majesty was a keynote speaker alongside France’s President Francois Hollande and Argentinean President Cristina Fernandez de Kirchner at ADSW. The opening ceremony was attended by Sheikh Mohammad bin Rashed Al Maktoum, Prime Minister and Vice President of the United Arab Emirates (UAE) and ruler of Dubai, and His Highness General Sheikh Mohammed bin Zayed Al Nahyan, Crown Prince of Abu Dhabi and Deputy Supreme Commander of UAE Armed Forces. “By being here today, you’re already part of the solution to the global energy crisis,” Queen Rania said in the address in Abu Dhabi. “The most crippling effects of energy poverty are felt by children. It is a cruel irony that those who’ve had the least to do with climate change and energy crises are paying the highest price. And they know it,” the Queen told the audience. “With capital investment and political will, we could light up schools for children … power health clinics for mothers and their babies … and pump clean water for families”. Her Majesty highlighted the commitment that Jordan and other countries in the region have toward renewable energy and sustainable development. She underlined that solutions to these challenges are directly tied to a “more corrective course for the region, using the potent energy of our people to chart the way forward”. 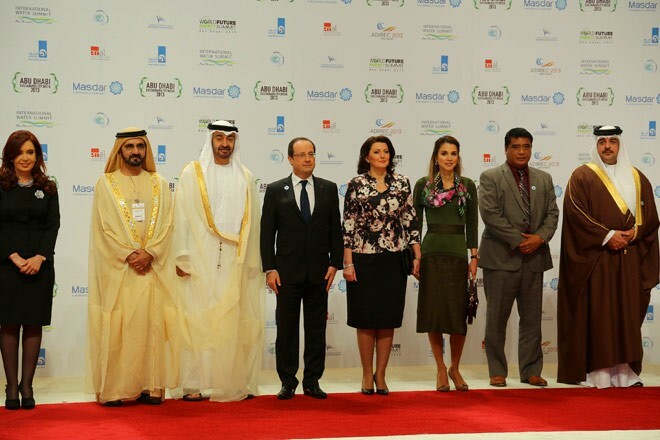 Her Majesty said “I am proud of Abu Dhabi … its global leadership role in sustainable development. And Masdar City … a test-bed for renewable energy and technology”. She expressed her pride that many innovative solutions to the challenges being faced are coming from the Arab world, citing Bedouin women in Jordan who are training to be solar engineers and are swapping using unhealthy kerosene lamps for solar power, saving families money, as well as in Egypt, where farmers are “exploring innovative irrigation methods to reduce water stress”. Queen Rania also underlined the importance of renewable energy in creating new opportunities in markets, saying that our region is “rich in the energy of our overwhelmingly young population, but poor in the opportunities we can offer them” and that with new energy we can “bring about a boom in the science, engineering and manufacturing fields, build green industries and green jobs and open new markets for aspiring entrepreneurs”. His Highness General Sheikh Mohammed bin Zayed Al Nahyan said in his speech during the opening that the efforts of the UAE in the field of energy and sustainable development are the result of the wise vision of His Highness Sheikh Khalifa bin Zayed Al Nahyan, and is an extension of the legacy of the founding father, the late Sheikh Zayed bin Sultan Al Nahyan. Other speakers at the ADSW opening ceremony included Dr. Sultan Ahmed Al Jaber, CEO of Masdar, and Peter Loscher, CEO of Siemens. ADSW draws over 30,000 participants from 150 countries each year to discuss the challenges facing sustainable development. ADSW consists of five integrated events; the third general assembly of the International Renewable Energy Agency, the sixth World Future Energy Summit, the International Renewable Energy Conference, the International Water Summit and the Fifth Zayed Future Energy Prize Awards Ceremony.